Welcome to my stop on the Cloud9 Block Design Blog Hop. This is day 3 of the hop, but in case you haven’t been following the action so far let me tell you all about it! 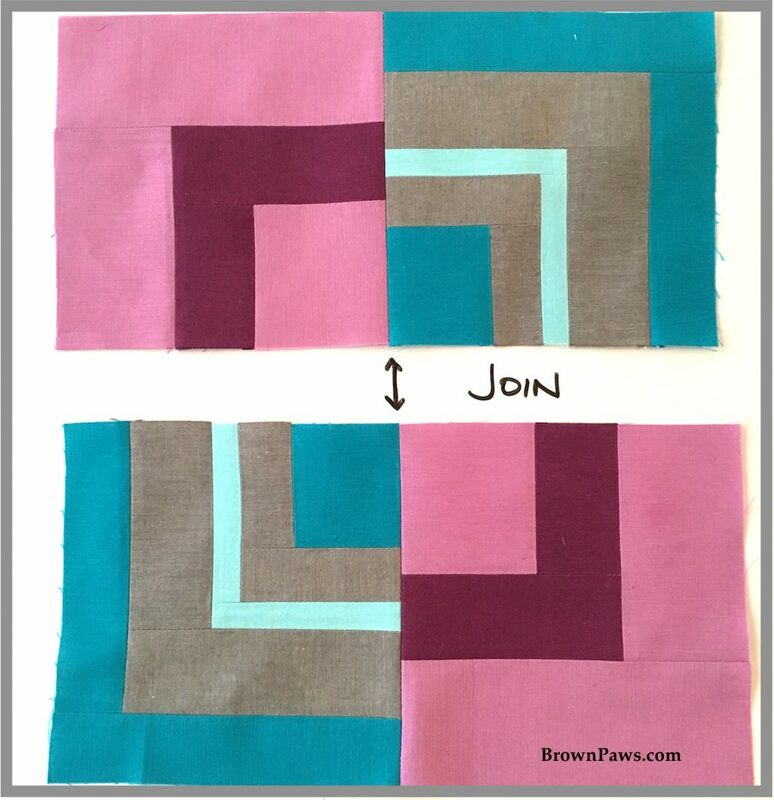 As a continuation of our New Bloggers Group, we were offered the opportunity to participate in this block design blog hop. 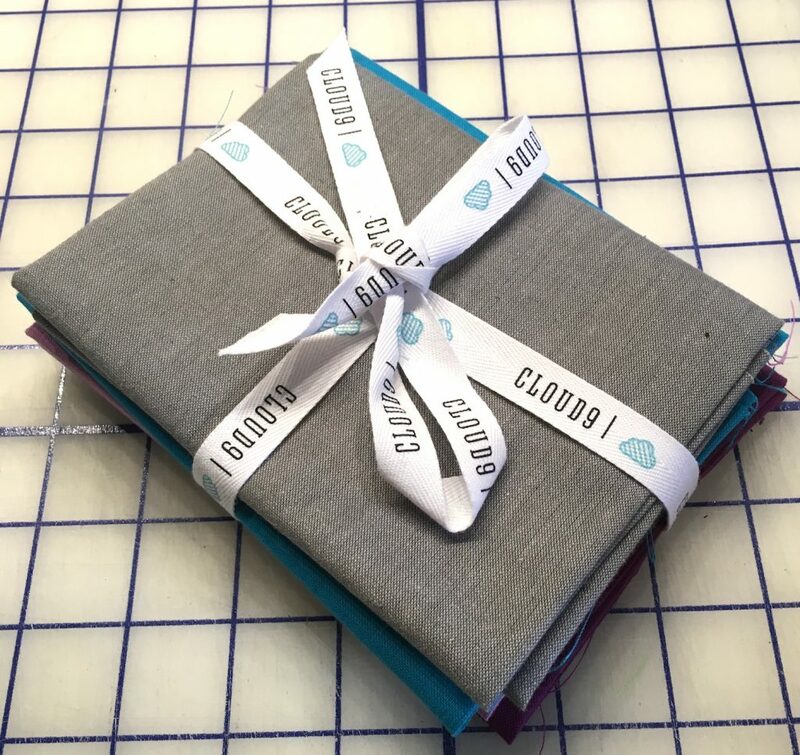 Cloud9 Fabrics generously gave each participant a bundle of their lovely fabric, and in exchange we agreed to design a block and write a tutorial on how to make it. Cheryl at Meadow Mist Designs will then take all of our blocks and put them together into a quilt for charity. What a great opportunity! 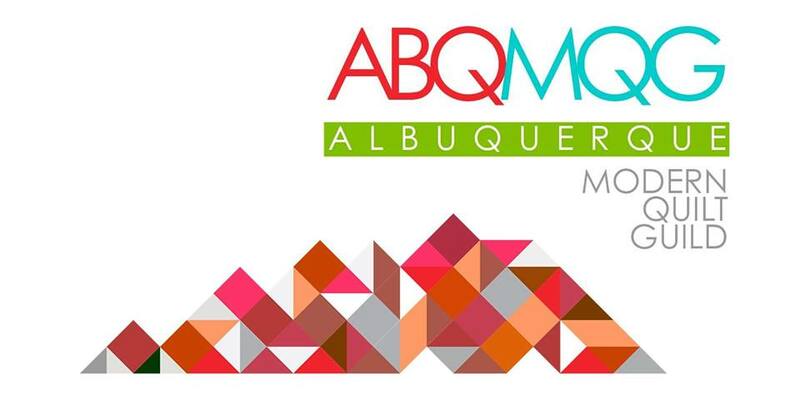 There is a long list of bloggers involved in the hop – you can see the whole schedule and list of participants at the end of this post. Thanks so much to Cloud9 for sponsoring this hop, and to Yvonne (Quilting Jet Girl), Cheryl (Meadow Mist Designs) and Stephanie (Late Night Quilter) for hosting it! Here is the fabric – it is really pretty, and really nice to work with. This is my block – I’m calling it Abstract Cabin. It is a take on a Log Cabin block, but with more of a non-traditional, abstract feel. All of the colors are so rich and beautiful that I really wanted to be able to off all of them. So let’s get started! Let’s cut into this stack. For fabric quantity, I used the bundle of fat quarters that were sent to us. However you don’t need the full fat quarter of any of the colors. If you cut carefully, you could probably do this with some larger scraps. The photo shows the size to cut, and the number of pieces to cut of that size in (). 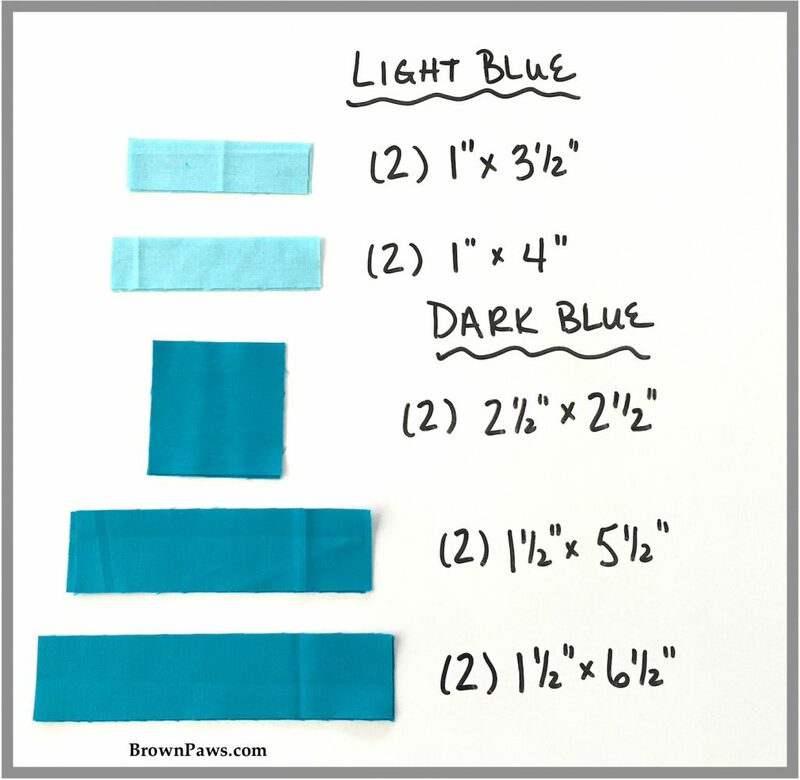 For example, the first section below says to cut two (2) 1″ x 3 1/2″ and two (2) 1″ x 4″ rectangles from the light blue fabric. Next let’s start on the Purple blocks. 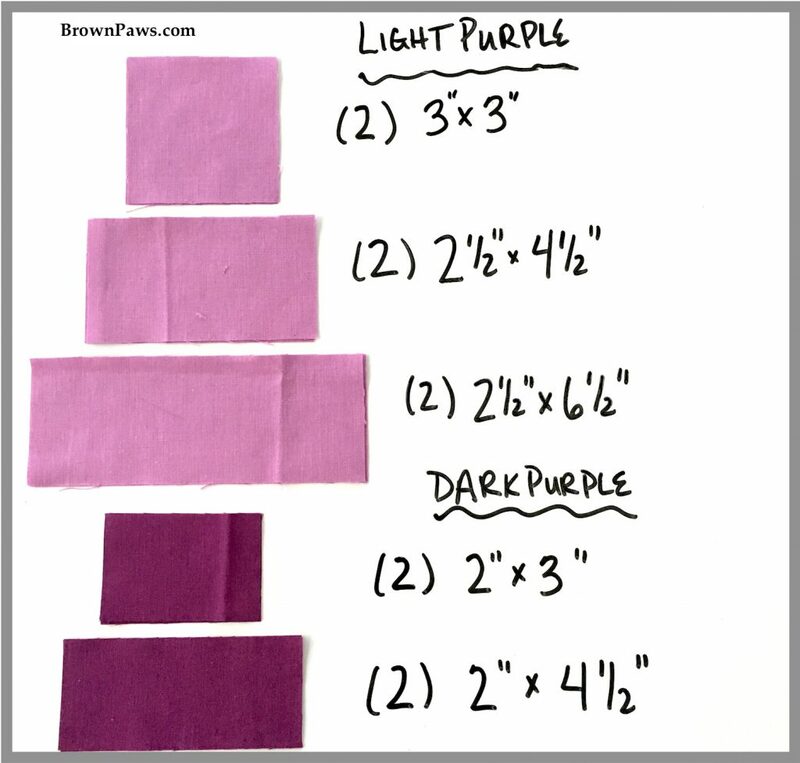 Sew one dark purple 2″ x 3″ rectangle to the left of the light purple 3″ square. Press the seam – open or to the side – whatever you prefer. 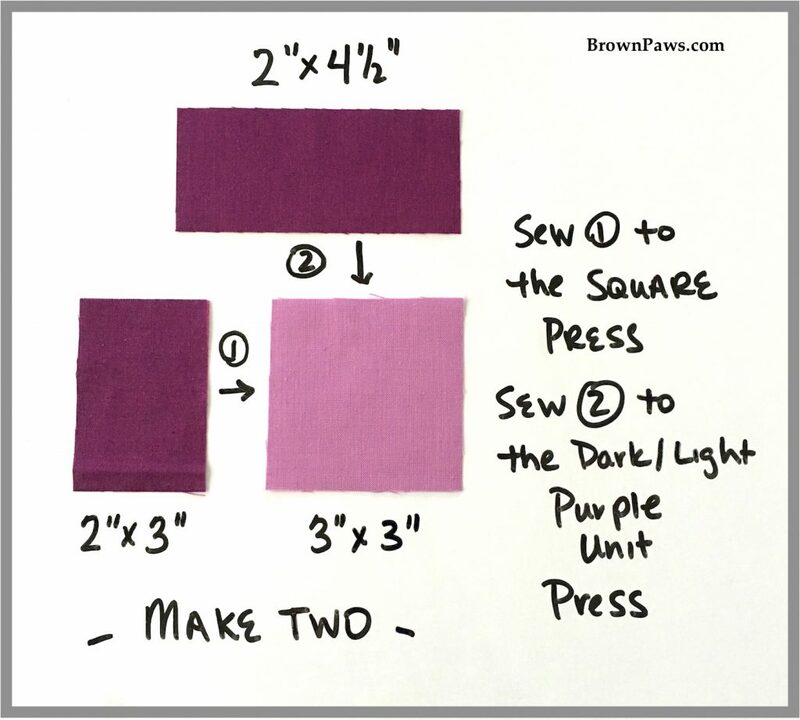 Sew a dark purple 2″ x 4 1/2″ rectangle to the top of the first unit and press the seam. Make two of these units. 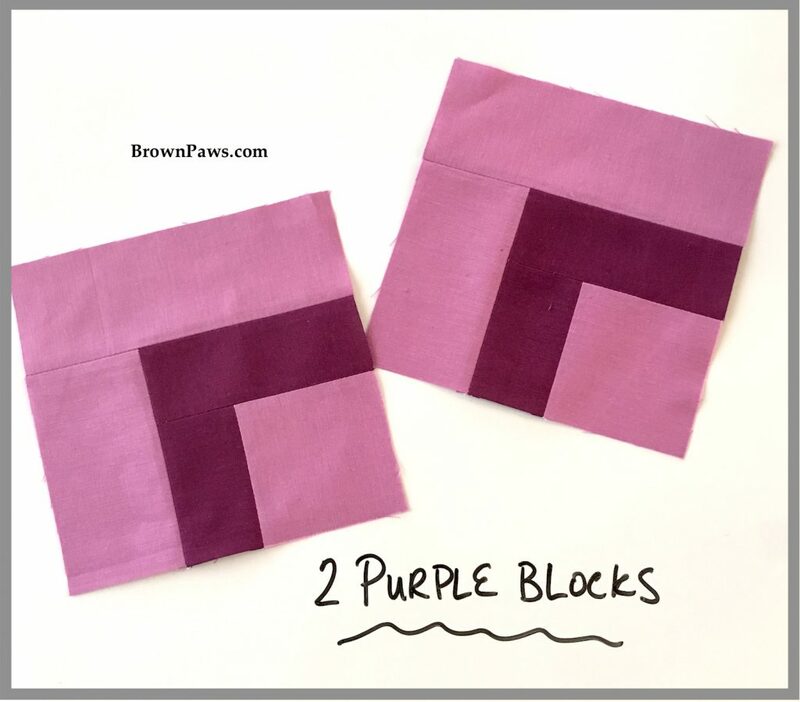 Sew one light purple 2 1/2″ x 4 1/2″ rectangle to the left of the block – see block orientation of the block below. Press the seam. 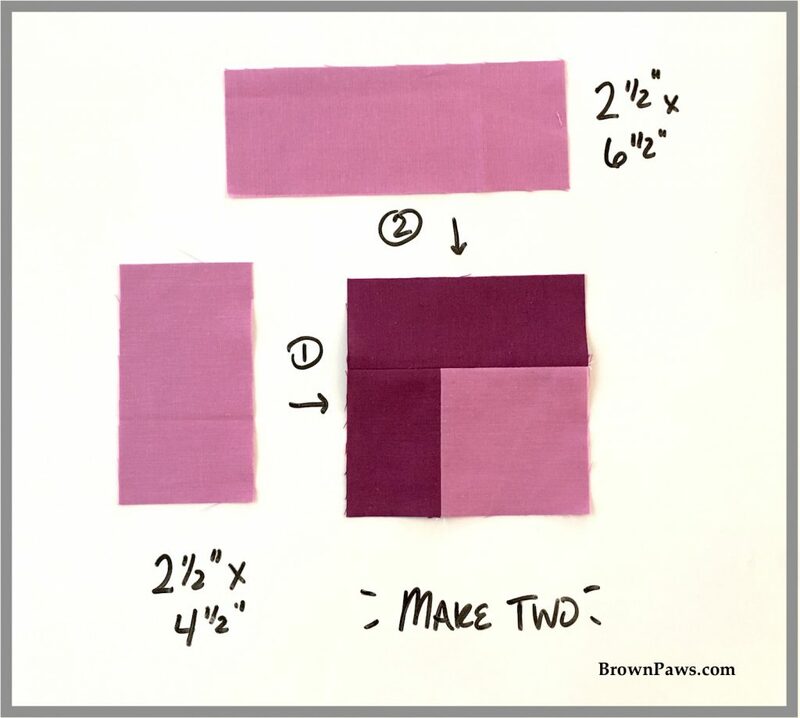 Sew a light purple 2 1/2″ x 6 1/2″ rectangle to the top of the first unit and press the seam. Repeat both steps on the second block unit. That’s it for the purple sub-blocks – aren’t they cute!?!? The Blue blocks are a bit more involved than the Purple blocks – not harder, but there are more logs to add to the block to get it built up. 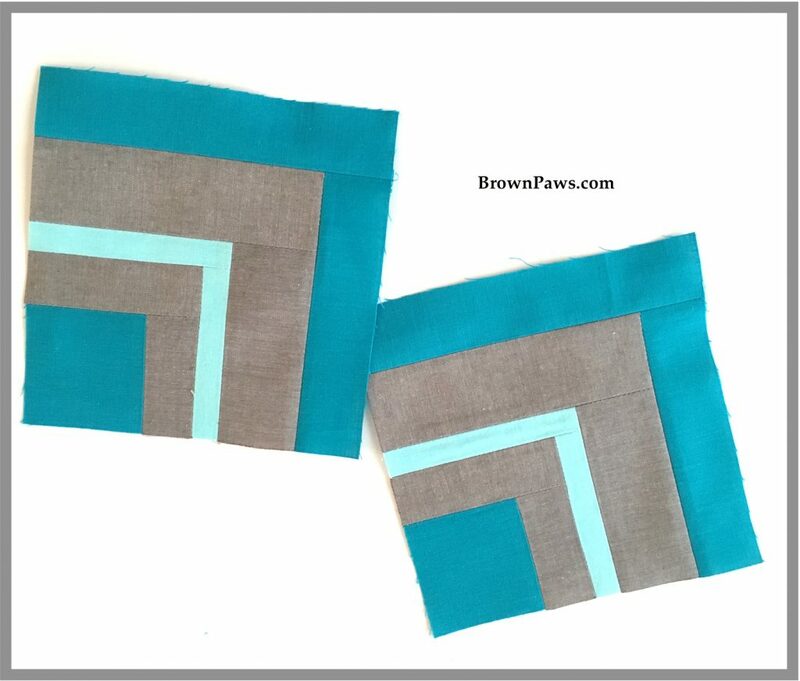 Sew one grey 1 1/2″ x 2 1/2″ rectangle to the left of the light blue 2 1/2″ square. Press the seam. 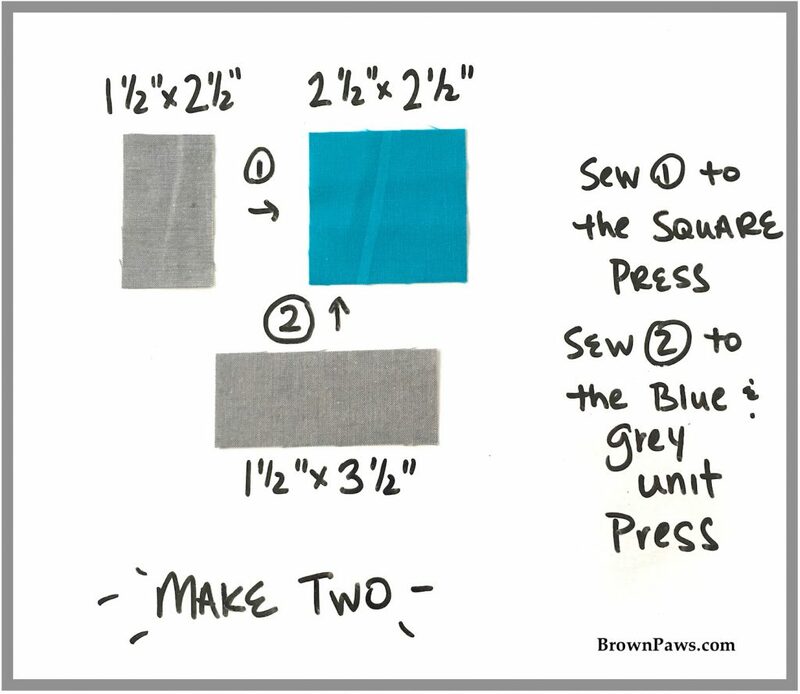 Sew a grey 1 1/2″ x 3 1/2″ rectangle to the bottom of the first unit and press the seam. Make two of these units. 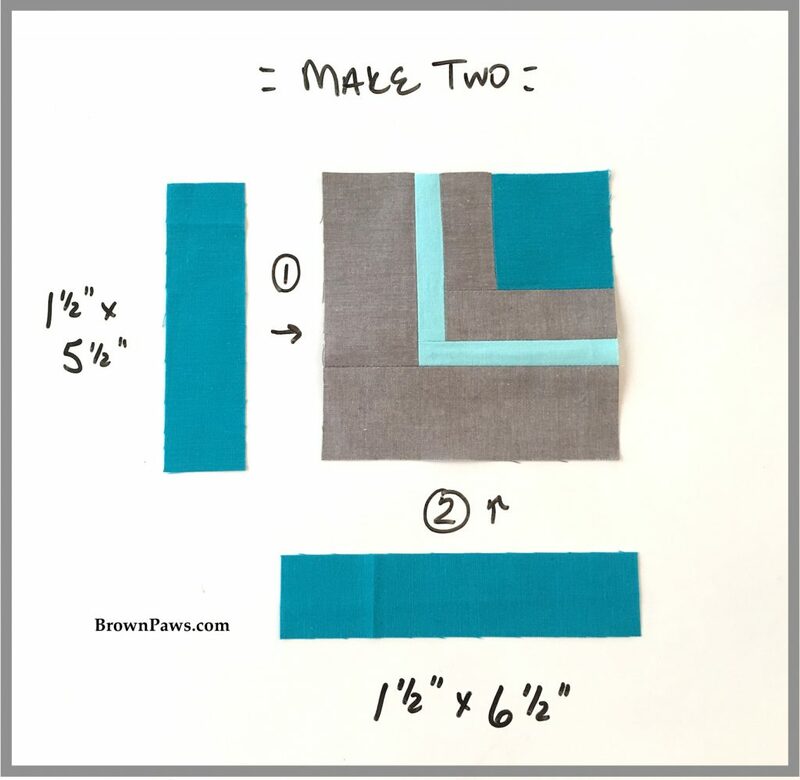 Sew one light blue 1″ x 3 1/2″ rectangle to the left of the block (see block orientation below in the photo). Press the seam. 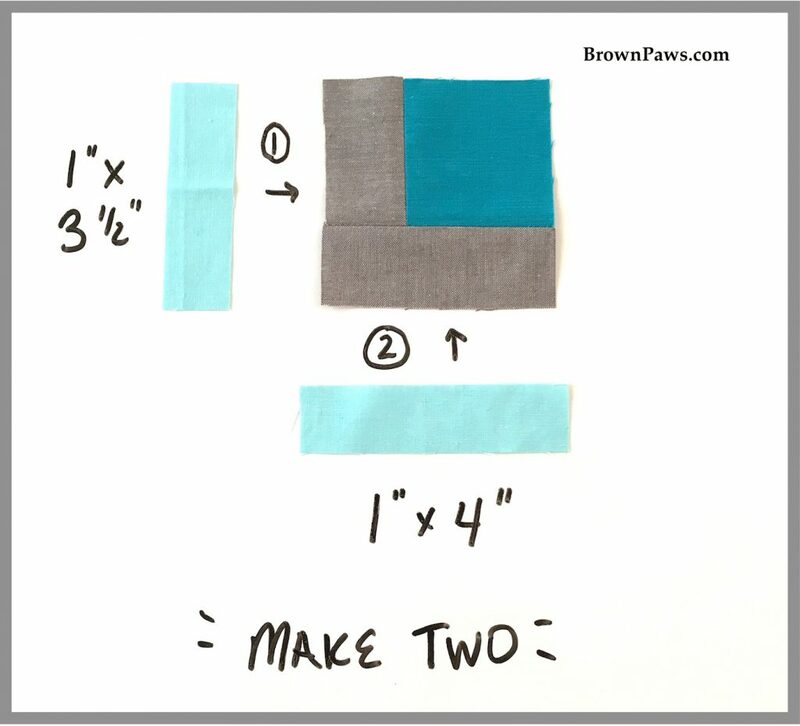 Sew a light blue 1″ x 4″ rectangle to the bottom of the first unit and press the seam. Repeat both steps on the second block unit. 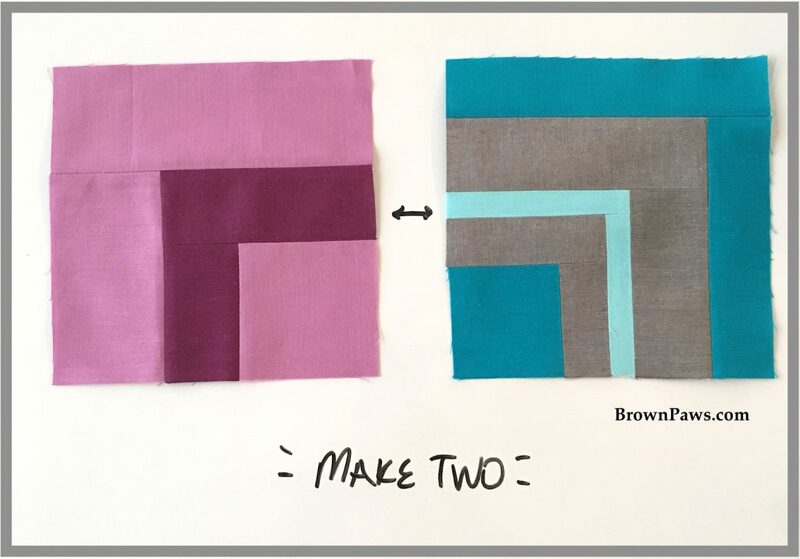 Sew one grey 2″ x 4″ rectangle to the left of the block (see block orientation below in the photo). Press the seam. 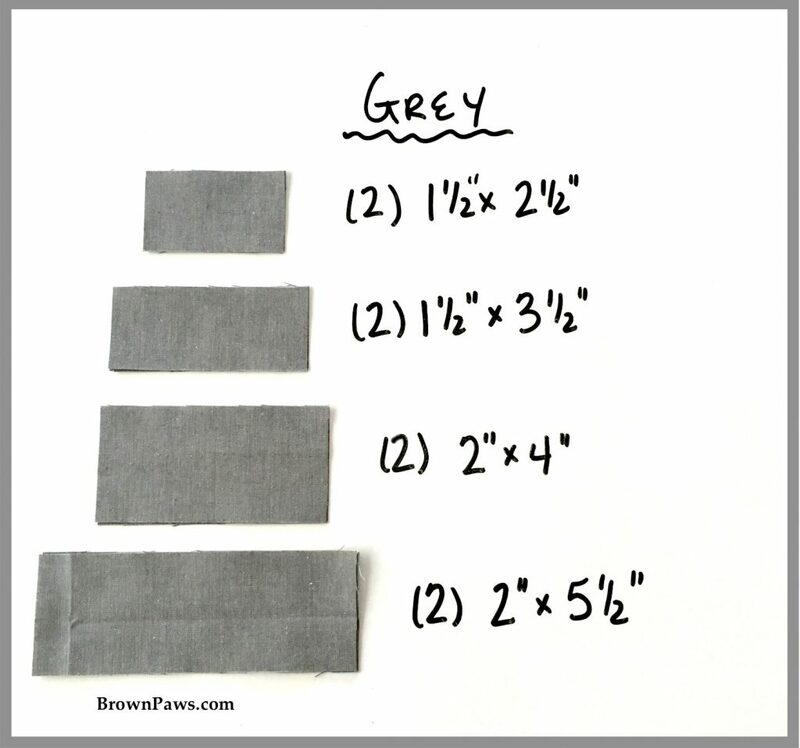 Sew a grey 2″ x 5 1/2″ rectangle to the bottom of the first unit and press the seam. Repeat both steps on the second block unit. Sew one dark blue 1 1/2″ x 5 1/2″ rectangle to the left of the block (see block orientation below in the photo). Press the seam. 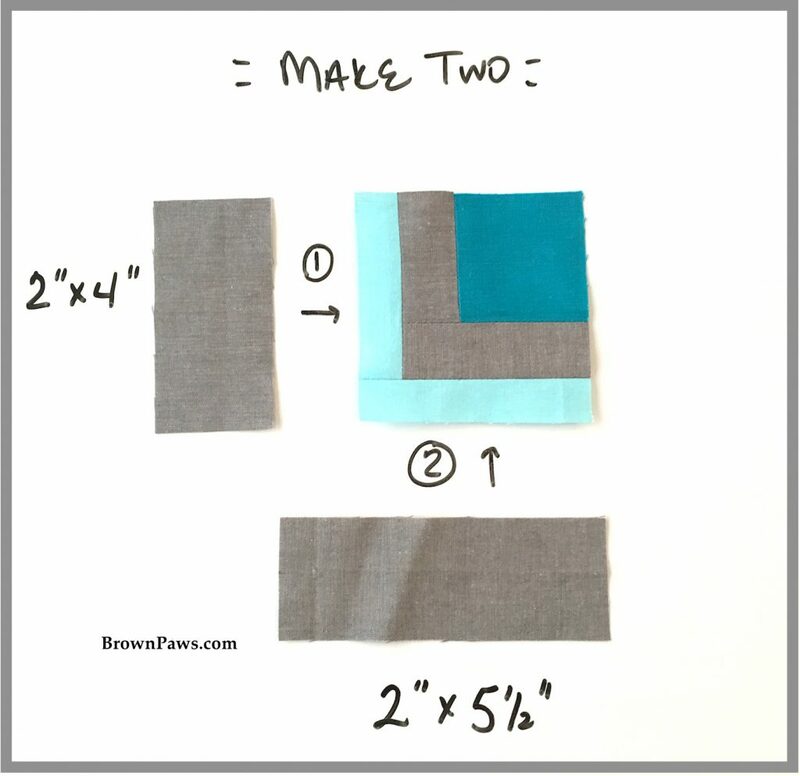 Sew a dark blue 1 1/2″ x 6 1/2″ rectangle to the bottom of the first unit and press the seam. Repeat both steps on the second block unit. That’s it for the blue sub-blocks – aren’t they even cuter!?!? Join the purple and blue sub-blocks as shown – make two of these units. Join the two halves of the block together. And that’s it! Cool Abstract finished block. I hope you like it! I’ll share a tutorial tomorrow on making the second block, which I’m calling ‘Strippy Squares’. Come on back tomorrow to learn about it! Here is the list for the blog hop stops – lots of really cool blocks to go check out. 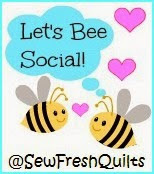 Ann @Brown Paws Quilting – THAT’S ME!!! Great modern take on a traditional log cabin block. Alternated with your second block it’s lovely combination for a very interesting modern log cabin. Thanks Kate! I designed them separately, but I was really happy with how nicely they wound up looking together. Thanks for stopping by! Ann, love you block. And I like your way of presenting the instructions, were they written on a white board? And you even made a quilt! Great job! Hi Paige, thanks so much! Yes, I wrote the instructions on a whiteboard and took pictures between each step. It was a pretty easy way to go, and fun to do. Thanks for stopping by! Nicely done! Thanks for the tutorial. Thanks Peggy! Really appreciate you stopping by my blog today! I really love wonky squares always. this is no exception – well done! I love your finished product, too. Those fabrics are just fabulous, aren’t they? Thanks Carrie! Wonky squares are fun, and here they were a fun way to show off lots of colors. The fabrics are fabulous! Thanks Susan! Really appreciate you stopping by. I love log cabin blocks! This one has elements of abstract, wonky, traditional…all things I lean towards! Great, thanks Jayne! I like modern takes on traditional blocks. I hope you give the block a try! If you do, let me know how it goes. Thanks Leanne, it has always been a favorite of mine too. Thanks for your comment about my tutorial too – it was fun to make. I loved your tutorial! It just felt fun and effortless. The block is fun too! 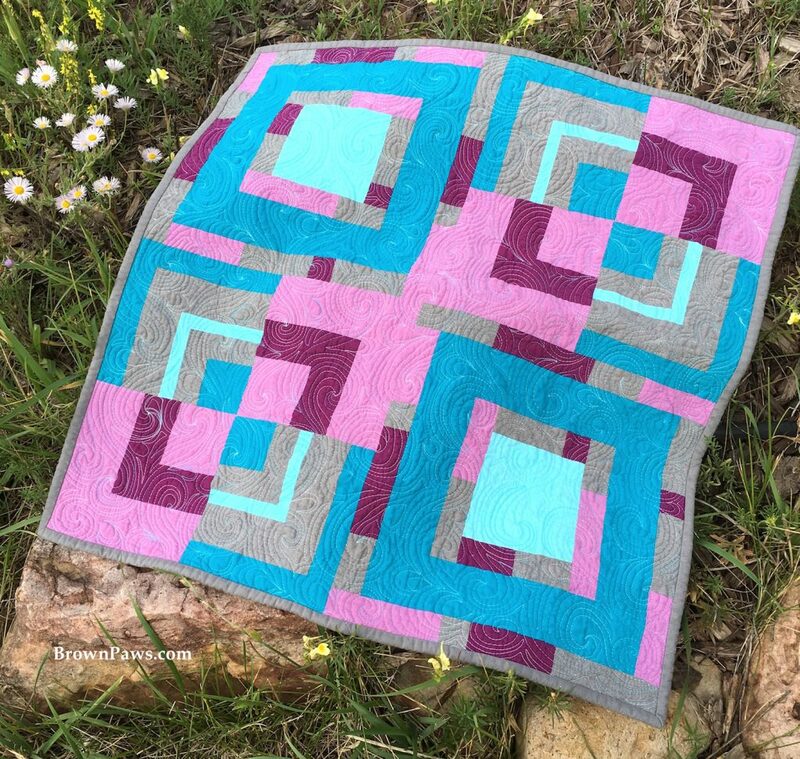 I especially love that you made a mini quilt and I will be back to your Strippy Squares block! Thanks also for coming back tomorrow for Strippy Squares – I hope you like it! Thanks Yvonne! I couldn’t decide which block to go with so I made them both, then I had some much fabric left over I just made a few more blocks. It was fun, but it was especially fun playing with the machine quilting. I finally worked out a swirl motif I had been trying to nail down for a few months. Thank you guys so much for all you’ve done, both for the new bloggers group and hop and then this hop. They have been lots of fun and I have really learned so much. Thank you! Ann, I love your block and the mini quilt you made using the block. They are wonderful! Many thanks! Thanks Jennifer! I had a great time making them both. Thanks so much for stopping by my blog. Thanks Olusola, appreciate your kind words. This hop was a bunch of fun. Well done. Your block is great. Thanks Anja! Really appreciate you stopping by my blog. What a fun block. i love it. The more modern the better as far as I’m concerned. it’s really nice with the different stripe sizes. Thanks Lisa, I really appreciate your kind words and you stopping by. You could do this block with all sorts of different numbers and sizes of strips – it would be cool. Such a cool block and I love the quilt! Great job! Thanks Sharon! Appreciate you coming by to check it out! Thanks Amista! Really appreciate you stopping by and your kind words. The quilt is so pretty. Great tutorial. Thanks Stephanie! Really appreciate you stopping by. this is really lovely. i just love how the color placement makes this such a fun block. and the completed quilt is just gorgeous. Love modern improv. Such a great block. I’ll be back tomorrow for the other one. Thanks Velda! And thanks for coming back tomorrow! Stunning.I love log cabin patterns and your design is an eyec catching.Grat job! Thanks Rosa! I love log cabins too, so this was really fun to do. Yep, I love your quilt and the way that you gave your directions. Tell us, did you use a white board or software – curious minds need to know (especially those of us who want to duplicate). Wonderful work (teacher talking). Thanks Mary! It is a whiteboard – I bought it at Target for ~$10. I was working so hard to design the block and get it made that figuring out how to get the pattern and tutorial written up on the computer was just beyond me. I just put the pieces on the whiteboard as I constructed the block and wrote notes on the side. I did have some problems however – if you make a mistake, figure it out later and don’t have any more fabric you can’t retake a photo (hence some sloppish editing on a photo tomorrow), and I’m not good enough with photo taking and editing to make the background really crisp and white consistently in all photos. But it was fun, and I learned a lot. I know there is software to do a whiteboard-like effect too – maybe I’ll look that up for next time! Thanks Melva! Really appreciate you stopping by. Thanks so much Karen. I appreciate your kind words, and stopping back tomorrow! great block! Using the different colours in different spots gives so many other options. well done! Thanks Anne! I really wanted to use all of the colors and make them pop out and shine. The colors were all so pretty. Thanks so much for stopping by my blog. Thanks Suzy, appreciate your kind words and you stopping by. Love this block Ann – really striking design and great tutorial. What a great mini you’ve produced – I have another block in my head to go with my block on a certain layout. Hasn’t it been so much fun designing and taking part? Thanks Abigail. It has been fun and I have learned so much. Thanks for stopping by! I just adore the interplay of the different sizes – it totally pops. Love it! Thanks Shannon! Appreciate you stopping by. I had fun making the block. Thanks so much Amanda, wow! I don’t think I’ve ever caused a gasp before :). The whiteboard was fun and it made the tutorial pretty easy to do. Good luck with it. Love the title of your blog! I also peeked at your Chemistry Quilt-the title intrigued me. These blocks are so amazingly different. These Cloud 9 colors are gorgeous together and the individual blocks are awesome. Can’t wait to see the finished quilt! Thanks Rosemary. My furry kids are the best! Thanks for taking a peak around my blog. Chemistry was fun to do and came together pretty quickly. 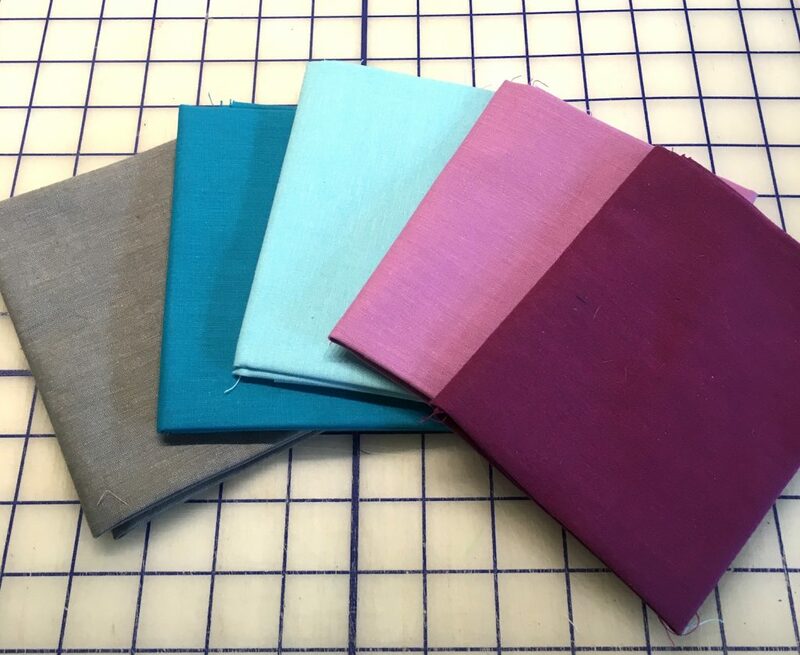 Yep, I really enjoyed the colors of the Cloud9 fabrics – this was a fun project to do. I love, love , love this block! Thanks Sue! Appreciate you stopping by! These colors are so beautiful. I love how you used so MUCH of the color. 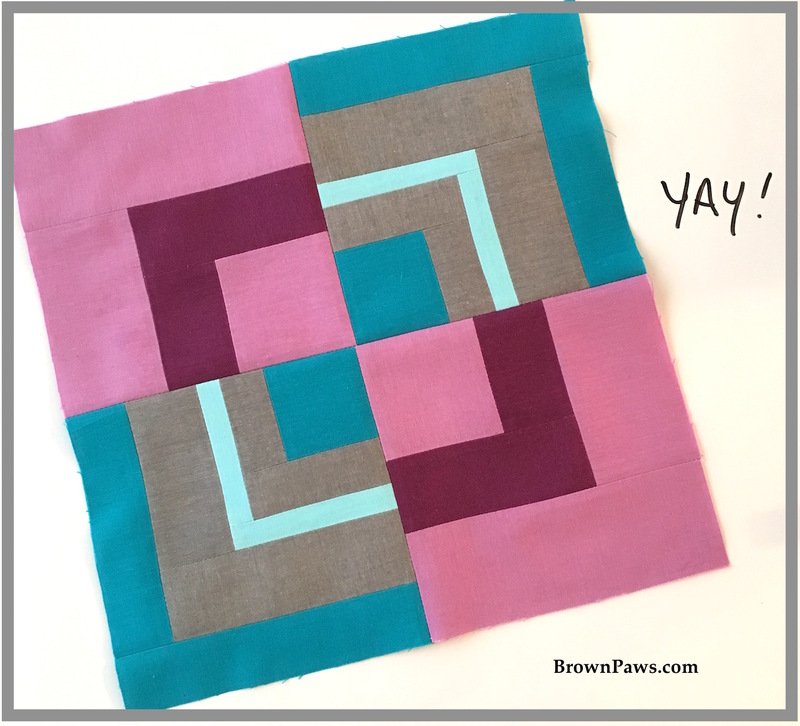 Both blocks you designed are perfect together and your mini quilt is GORGEOUS!! Thanks so much Janice! I did really like all of the colors so I was trying very hard to use all of it. I really didn’t design the blocks to necessarily go together, so it is cool they turned out fitting together so well. Thanks for stopping by. Thanks Dena! Appreciate you stopping by! What a great block! So easy and so versatile. Love how it looks in a quilt. And that mini is adorable. Great, great job.